In case I haven’t mentioned it before, I’m in love with Meebo. 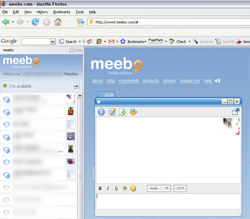 Meebo is a web based, multi-service instant messenger client. In addition to the usuals like AIM, Yahoo, and MSN, it also lets you use MeeboMe to let web visitors communicate with you directly in real time. I use it on my design portfolio website, and it has actually led to employment from someone who was checking out my work! The folks over at Meebo have kept development impressively fast paced, adding new features constantly. Now they’ve developed a Firefox Plugin that adds Meebo to your Firefox browser as a sidebar. Chats still happen in a Meebo tab. My friend Brian actually moved all of his IM communication, both desktop and laptop, over to Meebo. He gave the plugin a shot tonight and came away pretty underwhelmed. He brought up a good point… if the chats have to happen in a browser tab anyway, why not just load the normal Meebo page in that tab and use it as normal? Can anyone see the benefit of the sidebar plugin? At any rate, I’m excited to see more development from the Meebo team, and I’m sure this is mostly an exercise for them to move outside of the confinements of the browser tab. I expect we’ll see much more down the road.